For new parents, a quick jaunt around the aisles of your local baby-mart can be a pretty overwhelming experience. For the minimalist, it’s nothing short of a panic-inducing. Take a deep breath, friend. Whether you’re a devoted minimalist or just a parent with a limited amount of money and space, a minimalist baby nursery is totally within your reach. Not sure where to start? This helpful list of dos and don’ts will get you moving in the right direction! 1. Don’t buy an expensive, full-sized crib. Your little one won’t be in a crib forever. In fact, he may not spend much time in it at all. Many babies bunk in with mom and dad for the first six months to a year, rarely seeing the nursery. Even if your baby does spend time in his crib, he’ll be trading up in no time. Why invest hundreds of dollars in a piece of furniture you’ll only need for a year or two? While a convertible crib may stand the test time, it also takes up a lot of space in your home and your budget. Planning on having more babies? Your oldest will likely get bumped when you find you have need of the crib again, and you’ll end up buying a toddler bed anyway. Your best bet? Stick to the basics. Opt for a simple, budget-friendly cot with clean lines and a small footprint. When baby outgrows his digs, skip the toddler bed and move him directly into a twin, freeing up the crib for use by younger siblings. 2. Don’t buy a changing table. While a place to change your little one is a must, a changing table is not. Instead of paying a small fortune for a purpose-built changing table, create your own simple changing station by adding a changing pad to an existing dresser. Working with a tight space? Try one of these clever changing table alternatives. 3. Don’t overdo the accessories. Feel free to give your nursery a personal touch with art and accessories, but be careful not to overdo it. Remember, less is more. Instead of trying to cover every last square-inch of available space, focus on emphasizing two or three main focal points. For example, you might hang a single dramatic piece of art on the wall over the crib or create a cozy reading corner with a soft rug and a few accent pillows. Try to avoid dustables and other purely decorative items that tend to clutter surfaces. Instead, look for toys that double as décor, like a colorful wooden abacus or a beautiful set of hand-carved stacking rings, and strive to choose useful accessories that combine form with function. 4. Don’t underestimate the power of good lighting. Minimalism usually means doing more with less. Why buy three of something if you can get by with just one, right? But good lighting is a team sport. Relying on one overly bright ceiling fixture or a single, dim lamp can lead to eyestrain for both you and your baby. To get the balance right, focus on creating layers of light by using a number of lamps and fixtures to brighten the room as needed. Place your light fixtures in task-centric areas, such as over the changing table and beside the nursery chair, and you’ll never find yourself in the dark. 5. Don’t skimp on window treatments. A nursery should be dark and cool. While there’s nothing wrong with keeping your window treatments simple, you want to make sure they’re getting the job done. A warm and toasty nursery is not just uncomfortable - it’s dangerous. Installing double-lined, UV-blocking drapes or a set of heavy blinds can help your little one beat the heat during afternoon naps. You can also purchase UV-blocking window film, which reflects the sun’s heat and can be applied directly to the window glass. 1. Do keep bedding simple. According to the American Association of Pediatrics, a thin waterproof mattress cover and fitted crib sheet are all your baby needs to be safe and comfortable in their crib. Bumpers, blankets and other crib accessories, like sleep positioners or wedges, can be dangerous—even deadly, dramatically increasing your little one’s risk of SIDS. Even so-called “SIDS safe” products, like mesh bumper pads and individual slat covers, present unknown risks and are best left out of the crib. If you are concerned about your baby’s warmth and comfort, purchase one or two wearable blankets. These comfy sleep sacks envelope baby’s legs like a cozy, little sleeping bag. The top remains securely fastened around the torso, eliminating the risk of smothering associated with loose swaddling and traditional blankets. 2. Do consider a floor bed. A staple of the Montessori approach, a cozy floor bed provides toddlers with a safe and comfortable sleeping space while providing them with a basic level of autonomy over the natural instinct of sleep. It’s also a great fall-free training bed for toddlers as young as one. Once your little one is old enough to sleep safely alone, simply pop his crib mattress on the ground. Install a baby gate at the door, and you can rest easy, knowing your baby is safe in his bedroom. 3. Do buy a good nursery chair. When it comes to choosing the perfect nursery chair, comfort is everything. Clean lines and simple aesthetics are all well and good, but if you’re going to stay up half the night rocking a fussy baby, you’re going to want to be in a comfortable chair - A REALLY comfortable chair. Luckily, comfort and minimalism don’t have to be mutually exclusive. Already found the chair of your dreams? Before you swipe that credit card, make sure you can answer “yes” to these five important questions. 4. Do look for dual-use items and added flexibility. In a minimalist nursery, everything should have a purpose—or two! When choosing furniture, opt for dual-use items, such as a dresser/changing table or seating that doubles as storage. Flexible features, like castor wheels or a fold-and-stow design, are also a plus, allowing you to do more with less. For instance, you may not need a bassinet for the bedroom if you can easily transport your baby’s crib from one room to another. 5. Do get creative with closet space. No closet? No problem! Whether you’re sharing a room with baby or just making better use of your closet space, these clever no-closet solutions are all you need! A spare closet also makes for a wonderful miniature nursery space. 6. Do start a toy and book rotation. Instead of filling shelves and baskets with a ton of toys and books, try starting a toy and book rotation. Organize your child’s favorite playthings into several themed stations, and change the selection on a regular basis so that there is always something new and exciting to play with. Install low, sturdy shelves that double as play surfaces, and use book rails to display books where your toddler can see them. If you have the space, invest in a few large toys that encourage imaginative play, such as a teepee or toy kitchen. They may be a little costly, but they’ll offer hours of mess-free entertainment! 7. Do make it beautiful. 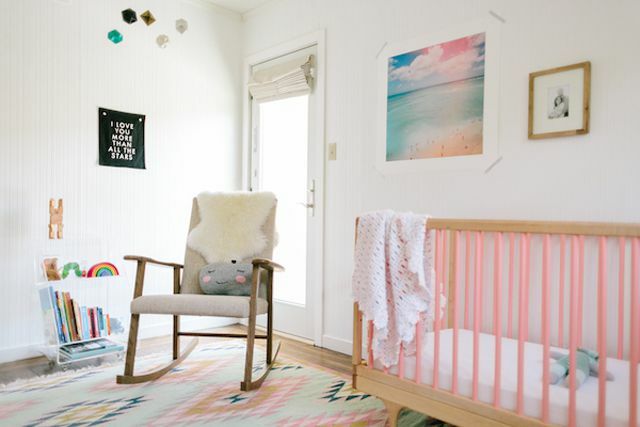 Your nursery may be simple, but that doesn’t mean it can’t be beautiful. Be sure to incorporate lots or rich, natural textures, and don’t be afraid to add a splash of color.